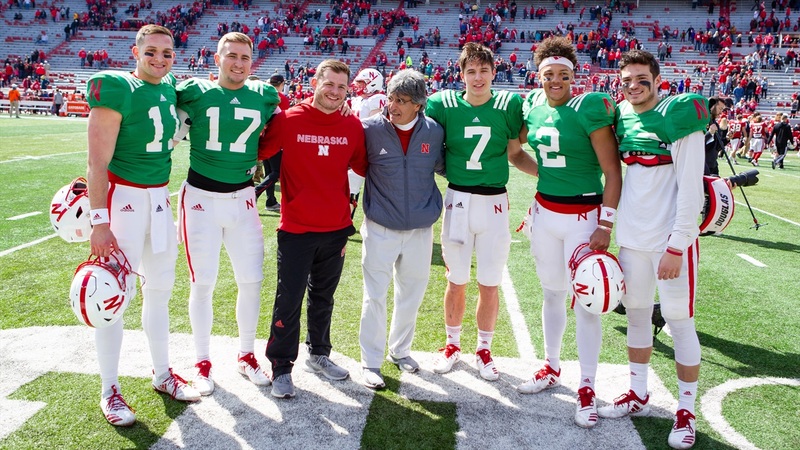 There were times in the not-too-distant past when that would’ve been an accurate count of the available quarterbacks on Nebraska’s roster and not the way to make sure five quarterbacks were all smiling at the same time for a “family” photo on the field. What a difference a year makes. Nebraska has a green team now, real quarterback depth. When the season hit last year, the Huskers didn’t have a quarterback who had taken a snap in an FBS game. Adrian Martinez won the job, Tristan Gebbia transferred, Andrew Bunch only had junior-college games under his belt, Noah Vedral awaited an eligibility waiver and Matt Masker was a true freshman walk-on. When Martinez was injured against Colorado, Nebraska had only Bunch and Masker, after Gebbia transferred, to take snaps against Troy. The offensive game plan that day reflected that reality. While the specifics of that situation may sound like a unique Year 1 problem, and was to a degree, it also should’ve felt familiar to anyone who has followed Nebraska football for the past decade. I spent part of the morning Saturday looking through a book on the Huskers’ 2010 season. It was a nice, nostalgic trip back to the Big 12, but what really struck me this time around was that the game photos from that year included three quarterbacks. Taylor Martinez won a high-profile offseason quarterback battle over Zac Lee and Cody Green, and was clearly the best option when healthy, but he wasn’t totally healthy all the time (despite playing 13 games). Lee and Green appeared in eight and nine games respectively. And we know now that season was the start of the Dearth of Depth Decade. Taylor threw all but 11 of the Huskers’ passes the next two seasons. When he went down early in his senior season, Nebraska had two options: a walk-on (Ron Kellogg) and a freshman (Tommy Armstrong). Over the three seasons that followed, Armstrong had 86.3% of all Nebraska’s pass attempts. When he couldn’t play, and that’s the only reason his percentage of attempts wasn’t higher, Nebraska had to turn to another walk-on (Ryker Fyfe). Add in that Tanner Lee year, which prompted another transfer (Patrick O’Brien), and then last year’s total reset of that room and you have a 10-season stretch where the Huskers were stretched extremely thin at quarterback. It appears to be over now. Five quarterbacks took snaps in the spring game, but the more notable thing here might be that nobody’s waiting on pins and needles for a presumed transfer announcement. That’s more than just unique in this era for a team with an obvious No. 1 at quarterback, it feels strange. Frost called Martinez “clearly a top player in the entire country.” Nobody disputes that and he doesn’t even need to include his position. But Martinez plays quarterback, and if all goes according to plan that means others can’t. The difference now? Others could. Others could because they’re willing to wait for that chance and it wouldn’t feel like a calamity if they had to. Vedral looked crisp and in command. Frost said he’s the No. 2 if Nebraska had to play again today, but it doesn’t so the competition will remain open through fall camp. Bunch, presumably No. 3, explored transfer options but chose to stay. The new guy, McCaffrey, dazzled with his running ability. Masker had one of the best throws of the day, a 55-yard touchdown to Wyatt Liewer that had Red team quarterbacks, Martinez and Vedral, celebrating on the sidelines for Masker, technically their opponent on Saturday. “We root for each other, in all cases,” Martinez said. I think you can go ahead and give quarterbacks coach Mario Verduzco a good deal of credit for creating that feeling. He’s researched it, written about it. He’s shown the results it can produce on the field. He has a family tree of quarterbacks, literally family, a few of whom were on the field after the game talking to the quarterbacks. That makeshift family gathering, a mix of actual family and the Nebraska family that’s been created in Verduzco’s room, is definitely a special thing, too. It would’ve been easy to assume this sort of thing was a relic of college football’s past, but the Huskers exit the spring with quarterback depth. One, two, three, four, five, Cubes.